Recently my mysterious fruity godmother (or is it secret admirer?) sent me a tray of beautiful Spanish Persimon. Well what can you do with such a gift other than create some fiery and joyous persimmon tarts? Also known as Sharon Fruit, from an Israeli variety bred on the Sharon Plain, this is a fruit that goes back a long way in European history. A European species was known as the divine fruit in ancient Greece as it was much loved by the Gods and was the source of the lotus eating legend. Persimmons are now cultivated in many parts of the world. They are available here in the UK between October and January. I was a little stumped at first as they are not something I’m particularly familiar with. I’ve tried the odd one over the years, but they’ve always been either under ripe and horribly astringent or have gone off before becoming edible. Persimmons it seems, come in two varieties. Hachiya has a high tannin content that makes it incredibly astringent unless fully ripe and very soft; these were the ones I have tried so unsuccessfully in the past. I understand when in the right condition, they are in fact the most delicious. Fuyu is more versatile. It has less tannins and is edible when firm as well as when soft and pulpy. It was the Fuyu variety that I received. Pleasantly free of pips and stones, the flavour is a a bit like a cross between a mango and a melon I found; CT favoured the mango comparison for both colour and taste. He thought it was nice to be able to grow a temperate substitute for such a great tropical fruit. Once I got to grips with these persimmons, I made all sorts of plans on how to use them. However, it turned out that they were excellent just as they were and like the lotus eaters of old, once started we couldn’t stop. We ate them whole with the skin on whilst firm or peeled and sliced them on top of our muesli. I will no longer be hesitant about buying these delightful fruit in the future. Luckily, I managed to save a few to play with. I left them to go soft so I could easily scoop out the pulp and use it in baking. I also had some hot, hot, hot chilli white chocolate made with the fierce naga chilli; this even left me, chilli fiend that I am, defeated. It had been lurking around in my cupboards waiting for just the right opportunity. This I felt was it: carpe chilliem. I would create some persimmon tarts by making chilli white chocolate pastry and filling it with a gingery persimmon custard. I was recently sent a pack of Taylor & Colledge vanilla products, which I will be reviewing shortly. One of the items was an innovative vanilla bean grinder, which I have fallen in love with. Freshly ground vanilla beans would, I mused, finish my tarts off very nicely. And they did. I am super excited about the new white chocolate pastry I have invented, which we both considered to be a great success. I meant to use my usual half wholemeal, half white mix, but I was daydreaming and most unusually for me, I ended up using all white flour before I realised what I was doing. The finished persimmon tarts were delicious warm and delicious cold. CT described them, in between licking his lips, as souped up custard tarts. The pastry was crisp with not a soggy bottom in sight. The chilli was more than just a background note, but not too fierce to eat – more of a warmth that kept growing as the tart was consumed. I never really saw the point of adding ginger to chilli until I tried it, but now it’s a firm favourite and the two flavours married well in this tart. The mango / persimmon flavour came through nicely. It was all rounded off by the fragrant vanillary top which added a certain tropical sophistication to this artisan confection made in Cornwall, where the climate is anything but tropical. A ginger flavoured persimmon custard topped with vanilla is set in a white chocolate and chilli pastry. The flavours of chilli, ginger, vanilla and persimmon marry beautifully. Can be served warm or at room temperature. Pour the flour into a bowl. Grate in the chocolate. Add the butter and cut into small pieces with a knife. Rub the butter into the flour until the mixture resembles breadcrumbs. Add enough water to just form a ball of dough – about 3 tbsp. Stir and form into a ball with hands. Roll out on a floured surface to about ⅛ cm. Cut rounds to fill 8x10cm tart tins. Place in the fridge to cool whilst getting on with the filling. Scoop out the flesh from the persimmon’s which should already be soft and pulpy. Blend it to ensure it’s completely smooth (I used a stick blender). Whisk the eggs in a bowl with a balloon whisk. Add the cream and sugar and whisk until smooth. Add the salt, ginger, lemon juice and persimmon pulp and whisk again until incorporated. Spoon the filling into the 8 cases, filling them to the top. Grate a little vanilla over the top of each one. Bake at 180°C for about 30 minutes until the pastry is golden and the filling has set. There is a new blogging event which I’m hoping to be a regular participant in, The Spice Trail from Vanesther of Bangers & Mash. As the name suggests a different spice will be chosen each month and this month it is chilli – hooray! These chilli persimmon tarts are just the thing. Apparently it was British Pudding Day on November 9th. With this in mind puddings has been chosen as the theme for this month’s Calendar Cakes which is hosted by LauraLovesCakes and DollyBakes. One of these persimmon tarts is also being sent over to Javelin Warrior’s for Made with Love Mondays where everything has to be made from scratch – sort of! I can’t get past persimmons on toast – but if I ever do I will try these! Fascinated by the vanilla bean grinder too. The vanilla beans I have at the moment are quite squishy, I don’t know how well they would grind. Haha Alicia, you can be trusted to come up with something novel. Who would have thought of persimmons on toast other than you? Good point about the vanilla beans. Haven’t opened the grinder up, but guessing they are quite dry. Something else to investigate as they will need replacing – sooner rather than later. i’ve never been a massive fan of these Sharon fruit, they’re too tomato-like for me but I think you’ve been incredibly inventive here and I really do want to try one of these tarts, they look beautiful. Interesting Dom, hadn’t thought of them as tomatoey, but now you come to mention it …….. but they do have a really nice flavour. I’m a convert now Jen, they are good to eat firm fleshed and also when they’ve gone all pulpy and very sweet, which is when they are good for tarts and baking. 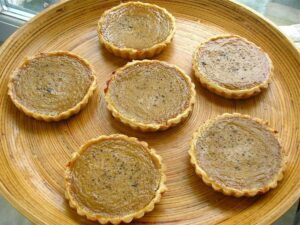 Thanks Rebecca, the spices really made these tarts. Thanks JW. Do give them a try, you won’t know what you’re missing unless you try them. We liked them firm, but they get very sweet when allowed to soften and go pulpy. Best eaten with a spoon at that point. I don’t think I’ve ever tried Sharon fruit before but I love the look and sound of these tarts, so very tempted to give them a go. White chocolate and chilli is such a fantastic combination too – although never tried naga chillies in chocolate – hot, hot, hot! A perfect entry for this month’s The Spice Trail. Thank you so much for sharing. Thanks Vanesther – try that naga chilli chocolate at your peril! The persimmons shouldn’t be quite such a shock. I know I would love these tartlets as I love sharon/kaki! Thanks Angie, I expect you’ve done some really interesting recipes with them. The persimmon/sharon is definitely a big favourite in my house at breakfast time while they’re in season. I never get to cook with them because there are never any left but this sounds a lovely idea so maybe I’ll hide some away for tart purposes. If I hadn’t had a great basket of these, I don’t think any of these would have made it into tarts or anything else, they are quite delicious. Thank you Laura, I can’t help but experiment. You don’t see enough persimmon recipes. Very true. It’s not really a fruit we are that familiar with – yet!